We are living in a digital world. Our computers and phones are an essential part of everyday life as we enjoy exploring the internet for information, connecting with family and friends via social media, instant messaging and mails. As people and businesses use this technology more than ever, it is important that all Australians have the skills and confidence to engage online. The Be Connected program allows older Australians to develop their confidence in a supportive environment and learn how to remain safe online while connecting with loved ones. 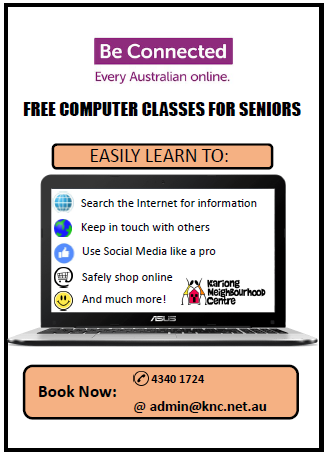 Enroll for FREE computer lessons for seniors and people with disabilities here at Kariong Neighbourhood Centre. Our team of local volunteers are here for you.